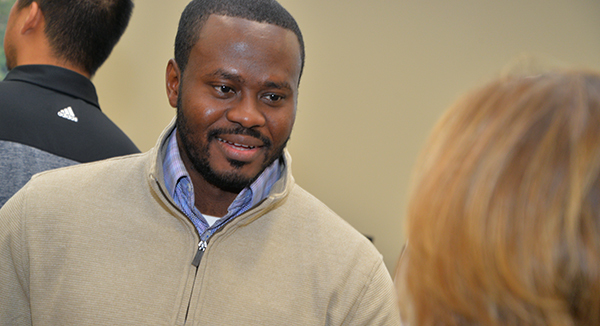 Through Sylvester Obafunwa's ability to apply business concepts he learned in college, he flourishes in the analytics arena, even though the term ‘analytics’ barely scratched the surface of business curriculum 10 years ago. “One of the big things I learned through an entrepreneurship class is when you understand concepts of the components of business, they become applicable anywhere. Whether you’re starting your own business or working in corporate America, you use the same approach. You have to understand the product you’re selling, the consumer marketplace, the finances – that class brought everything together,” Obafunwa said. He received opportunities to use his system analyst background quickly by landing an internship through the university career fair. The good-natured attitude of people at Nebraska provided an atmosphere of support in which he could thrive. “One thing that doesn’t change is the mentality of Nebraskans. When I first came here and got off the plane, the stress just fell off me. It speaks to an amazing feeling you get from being here,” he said. That at-ease Nebraska feeling stays with Obafunwa even now as he works in Las Vegas as director of digital analytics at MGM Resorts. Previously, he worked in similar capacities at State Farm Insurance and Ultimate Fighting Championship (UFC). Through his ability to apply those concepts he learned in college, he flourishes in the analytics arena, even though the term ‘analytics’ barely scratched the surface of business curriculum 10 years ago. Recently, Obafunwa returned to the College of Business as part of multicultural homecoming events in collaboration with the Chancellor’s Commission on the Status of People of Color, where he was recognized as a distinguished alumnus of color. He talked to business students about replicating his path of finding enjoyment at work every day. He impressed upon students the importance of adaptability. According to Obafunwa, you need to be willing to grow when a new field such as analytics takes the world by storm, and you can do it when grounded in the principles of business. Obafunwa's career has taken him to such varied employers as State Farm Insurance, Ultimate Fighting Championship and MGM Resorts. “Every semester something can happen that will change the way you look at business and change the way you look at technology. Keep moving forward and allow the feedback of conversation to say, ‘Hey, I notice there’s an announcement based on a new privacy act.’ That may change the way we look at technology going forward so let’s incorporate it in our dialogue. Things will change but if you are grounded in the skill sets and knowledge you learn in college, you can do what I did and go from financial services at State Farm to the entertainment world of UFC and the hospitality industry of MGM Resorts,” Obafunwa said. At MGM Resorts, he bridges the gap between digital users planning a trip to Las Vegas and the trip being an enjoyable experience for everyone. By studying data, he improves outcomes. Obafunwa tries to do his job with the same supportive approach he learned in Lincoln. He also experiences it himself every time he returns home.